If you have suggestions or concerns, please email us at glenn (at) magiccarrot.com or kathy (at) magiccarrot.com . Glenn’s now-wife Kathy introduced him to Killer Bunnies® in 2006, and they were married in 2007. 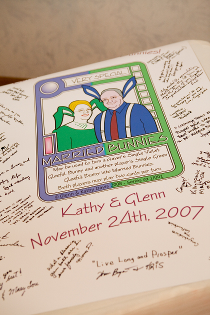 Their “guest book” was a giant Killer Bunnies® poster. Of course, Glenn lost that game (with only the Blue and Yellow decks) badly, though many neophites win their first Killer Bunnies game. The second game (including card decks through Violet) was equally lop-sided. However, Glenn found the game intriguing, with its unique random outcome. Glenn began trying to learn the rules and find an online community for this game, when he stumbled across MagicCarrot.com, which was under the previous ownership at the time. (Look, you’ve read this far, you might as well finish). 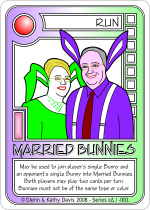 A year earlier, Kathy had introduced Glenn to a silly card game played with special card decks called “Killer Bunnies and the Quest for the Magic Carrot.” In preparation for the proposal, Glenn created a Very Special card, which he called “Married Bunnies,” the rule for which is you can pair a Gleeful Violet Bunny (Purple is Glenn’s favorite color—if you haven’t noticed from the color of the web site!—but in the context of the game, it is called Violet) and a Gleeful Green Bunny (green is Kathy’s favorite color) and create a pair of “Married Bunnies.” These players can then play two cards per turn instead of one. Kathy didn’t have all of the expansion decks, so Glenn hunted down the “Wacky Khaki” Killer Bunnies® expansion deck and placed his Married Bunnies card in a lexan holder inside the Wacky Khaki box, which was one of the things he smuggled in. The other, of course, was the ring. Back to the proposal... Even though Glenn was dropping Kathy off after dinner, Glenn sat down on Kathy’s sofa and motioned her over to him. She sat down and he handed her the Killer Bunnies Wacky Khaki expansion deck. Kathy, having recently played with this expansion deck, was very pleased at this unexpected gift. When she opened the box, she discovered the “Married Bunnies” card Glenn had placed in there. She spent a few moments reading the rule, during which time Glenn knelt in front of her. 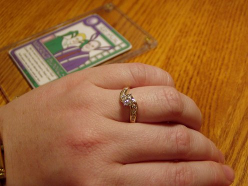 When she realized Glenn had knelt, he popped the question: “Will you be my Married Bunny?” and Kathy immediately said “Yes!” Only then did Kathy realize that the bunnies pictured on the Married Bunnies card were cartoon-bunny versions of them! After that, Glenn placed the beautiful ring on Kathy’s finger. This was his very first Killer Bunnies® card and it turned out decently for a first effort. However, the manner in which it was drawn was primitive compared to how he creates fan cards today.